SOG Specialty Knives (generally known as SOG) was established back in the mid-eighties by Spencer Frazer, a budding knife designer from California. The name SOG is derived from the Studies and Observation Group, a special ops unit serving in Vietnam who used a particular type of bowie knife on their missions. Spencer wanted to pay homage to this unique knife created by the SOG team and his business slowly grew into bigger and better things as it gained traction. So much so, SOG became the official brand of knife carried by the Navy SEALs and other military forces particularly in the US. These are the roots that made SOG what it is today – a passionate knife enterprise focused on tactical and combat style designs yet offering up many qualities appreciated by huntsman, campers and other general outdoor enthusiasts. 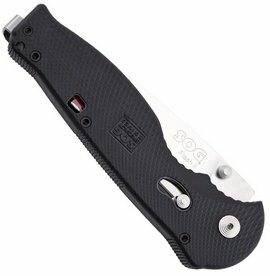 Here are KnifeInformer.com we are continually impressed by SOG’s innovation and commitment to quality in their knives. If you’re a regular visitor here you probably know that the SOG Flash II is one of our favorites. If you want to know why, read on…. Great choice for a lightweight tactical EDC which won't break the bank. The SOG Flash II is a tactical folding knife and represents the ‘bigger brother’ of the SOG Flash I which is not only smaller but slightly different in a few other areas. The SOG Flash II weighs just over three ounces and measures four and a half inches when closed so it’s fairly light and just above average size but still within the realm of an EDC knife. The Flash II’s three and a half inch drop-point blade is made from AUS-8 steel with a full flat grind and satin finish. The result is a fairly simple looking blade but one that’s pretty effective, particularly at slicing. AUS-8 is a Japanese steel that’s reasonably good quality and will sharpen and hold its edge quite well but nowhere close to a higher end steel like S30V or even 154CM. Still, it’s pretty easy to re-sharpen and not bad for a knife in this price range. On some variants the blade is coated with Titanium Nitride (TiNi) and it also comes in a partially serrated version which many of you will prefer to enhance overall usefulness. The blade deployment is complemented by SOG’s Assisted Technology which basically means it’s spring assisted and opens rather fast. This can be extremely helpful in many situations. 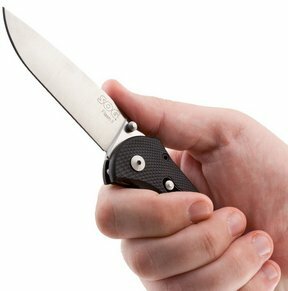 For additional safety, SOG has incorporated a safety-lock in the form of a small switch on the handle which when engaged will prevent the blade opening accidentally. A nice touch for some but many will undoubtedly choose not to use it as it can become annoying to forget it’s engaged. The lock up uses a piston mechanism which we found to be reasonably tight but we did encounter some minor blade side-play. This can be adjusted to some degree by tweaking the pivot but we were not able to eliminate it. The handle is typically fiberglass-reinforced nylon (FRN or GRN) which is also known as Zytel. This is a tremendously tough material which is extremely difficult to damage or break. In general we do prefer G-10 handles which tend to add a little more grip but are typically slightly more expensive. Still, we found the handle is somewhat chunky but reasonably comfortable and sits well in the hand. One thing to point out is that the handle does not contain any liners. The Flash II carries SOG’s unique reversible pocket clip which is positioned to allow for the knife to sit deep in the pocket and maximize concealment. Note that the pocket clip positions the knife ‘tip-up’ and cannot be adjusted for ‘tip-down’ orientation. Ergonomics are generally very good and we did not experience any slip when gripping the knife in wet conditions. Given the effective shape and relative hardness of the AUS-8 steel blade this knife would perform well in most everyday cutting situations as well as tactical or combat applications. The handle is tough and will withstand the harshest conditions and really take a beating without showing any glimpse of weakness. We have no reservations in using this knife as a general all-rounder. Overall the SOG Flash II just feels right in almost any situation and at this price it’s a steal. The Good: Great ergonomics. Lightweight. Excellent quality for the price. Inexpensive. The Bad: May experience some blade play. May be a little big for some. Bottom Line: Remains one of our favorite choices for tactical EDC in this price range.